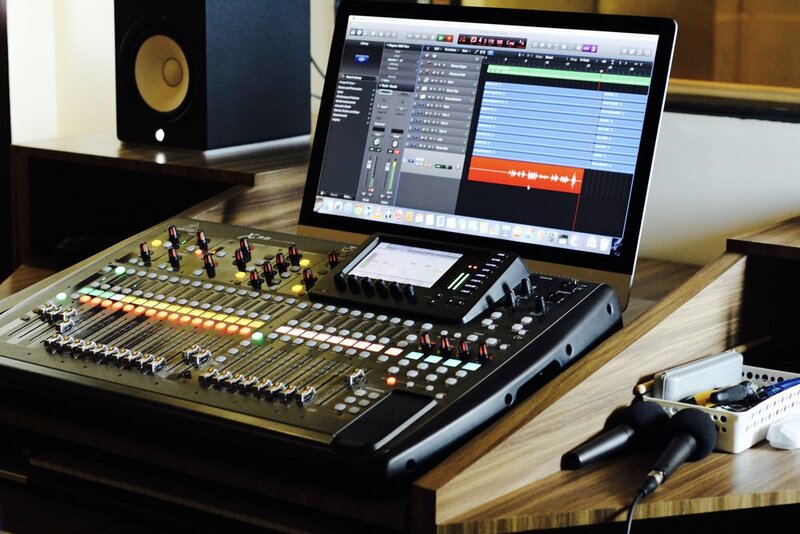 This page consists of my highlight music technology projects I worked on over the last few years. Majority of the projects involve Hyper-Instruments design, audio signal processing based projects and digital & analog music visualizers (few signal processing based, and some completely hardware). My current interests are in the lines of AI based music production tools, Automatic Mixing and Spatial Audio, particularly Binaural Sound Synthesis, Directivity Modelling, Audio Up-mixing and Automatic Spatialization. Built this Digital Musical Instrument (interpretation of 'The Sponge') out of a block of foam, fit with several sensors, to perform some of my electro-acoustic compositions. OrkID is an improvisational quintet founded this year at the Input Devices and Musical Interaction Lab, McGill University. We performed this piece at several concerts including Live@CIRMMT : Centre for Interdisciplinary Research in Music Media and Technology. The "T-Stick" is a cylindrical controller with motion and pressure sensing sensors. I developed my mappings on Libmapper to drive my effects processing patches programmed on MaxMSP. This video introduces few hyper-instruments designed by us at IDMIL, McGill University. Here's our pilot jam session in which we have used several hyper-instruments we designed. Reports and implementations to all my projects and research are available on request! Designed and developed a novel automatic mixing algorithm to spatialize sound sources of a multitrack recording for masking minimization. 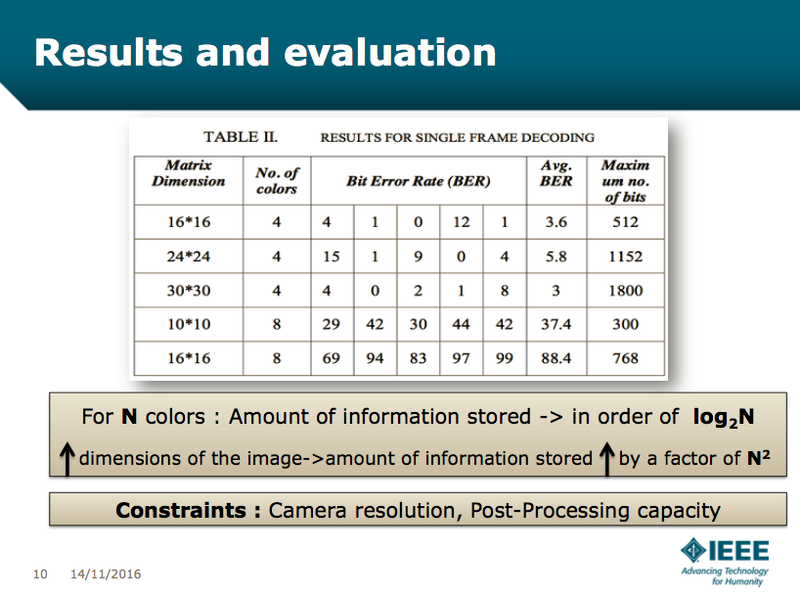 Utilized time-frequency analysis techniques: spectral decomposition, sub-grouping, frequency based spreading, particle swarm optimization based on MPEG Psychoacoustic Masking Model. Designed an STFT analysis-synthesis model to perform up-mixing by deriving relevant statistical parameters from the stereo signal to create an immersive feel and produce a stable center channel for off-axis listening. The core techniques were ambience extraction and source re-panning by computing instantaneous inter-channel coherence and similarity measures. (Ongoing): Conducting research on building a parametric HRTF model based on time-domain description of the physics of wave propagation and diffraction for binaural audio playback, HRTF individualization and auralization using diffuse rendering. Investigating efficient methods to render directivity patterns for sound sources in Ambisonics. Implemented, compared and evaluated two sparse approximation techniques based on greedy as well as relaxation methods: Lasso-based regression and Orthogonal Matching Pursuit, for audio denoising. Explored the orientation estimation problem for IMUs using sensor fusion with extended Kalman filter, Mahony’s nonlinear complementary filter and AHRS algorithm. Achieved a robust low-latency system implementation with minimal drift. Aim: To use Electroencephalography (EEG) for decoding motor tasks thought by the user, to move an on-screen pointer thus enabling typing or drawing, or ‘BreXting’, using a standalone system with just an FPGA and a custom portable EEG headset. Current Implementation: Trained a Convolutional Neural Network (CNN) with the BNCI Horizon 4-Class Motor Imagery dataset, the CNN architecture along with the stored weights are implemented on an FPGA, whose outputs trigger mouse pointer movements on a PC via JTAG. A novel music education tool that consists of a network of self-contained ERM vibration motors hooked onto Atmega328p micro-controllers. nRF24L01 RF modules enabled bi-directional communication of MIDI messages using which the teacher triggers timed vibrations on the haptic actuators strapped onto the limbs of the student drummer. Unlisted video: available on request! LED wall consists of a huge music equalizer(visualizer), two side woofers and an amplitude controlled bulb array. 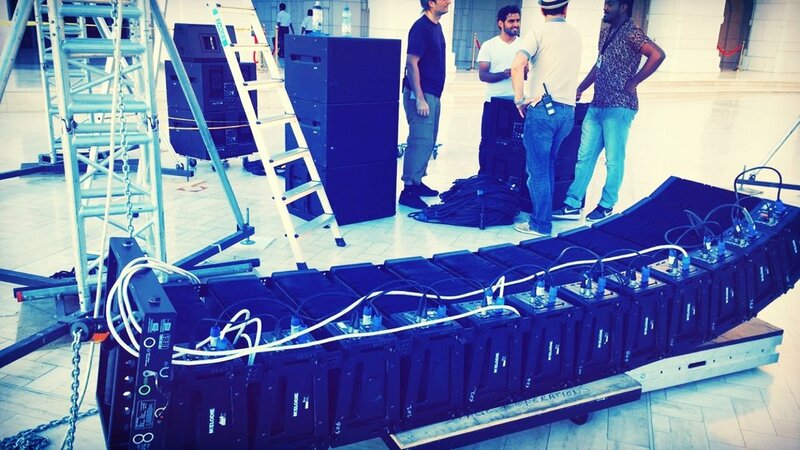 The whole assembly is controlled using a TLC5916 array controlled by a MSP430 which receives serial data from a python based music processing library known as Phosphene developed by us, a team of music tech enthusiasts for our college tech fest. Set up a Node.js server to broadcast data (push colors) to clients (mobile phones of audience, connected to Wireless Network after detecting beats from music played at the arena. Connection between clients and server was established using Websockets. Built a hardware VU meter and a audio signal processing based projected visualization in my dorm room by hacking into my TASCAM US16x08 digital interface with a 16 channel band pass-filter design coupled with LED driver circuits which also drives my table backlight. 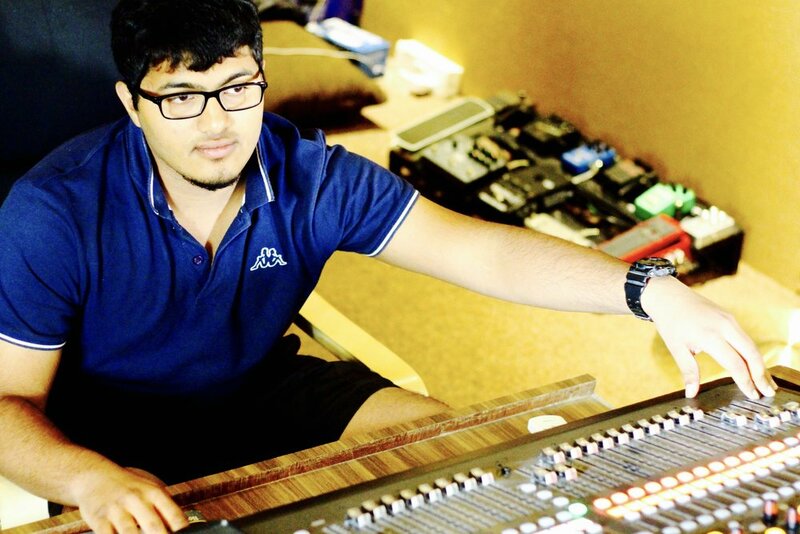 SMART Band involves multiple wearable MIDI devices/hyper-instruments connected in a local network using various M2M protocols and MIDI protocol connected to a central DAW(Digital Audio Workstation). Air Synth : Hover your hand over the photo-diodie based comparator circuit to generate your favorite synth sound. Laser Harp is light-based hyper instrument which works just like the musical harp. Instead of the strings, you interrupt the path of lasers to the LDR array circuit to trigger different sounds at different heights of interruption. Smart Glove: MPU-6050 accelerometer connected to an Atmel Atmega-328p micro-controller recognising hand gestures and the DAW can be configured to generate any effect the user chooses. Smart Flute: Consists of an array of button switches and a custom made sound sensor(which can detect intensity of blowing) passed though an ADC thus emulating working of an actual Flute. MIDI Voice: This project involved feeding voice signals to TASCAM US16x08 Digital interface which further undergoes analysis through mathematical morphology based algorithms to trigger MIDI notes. 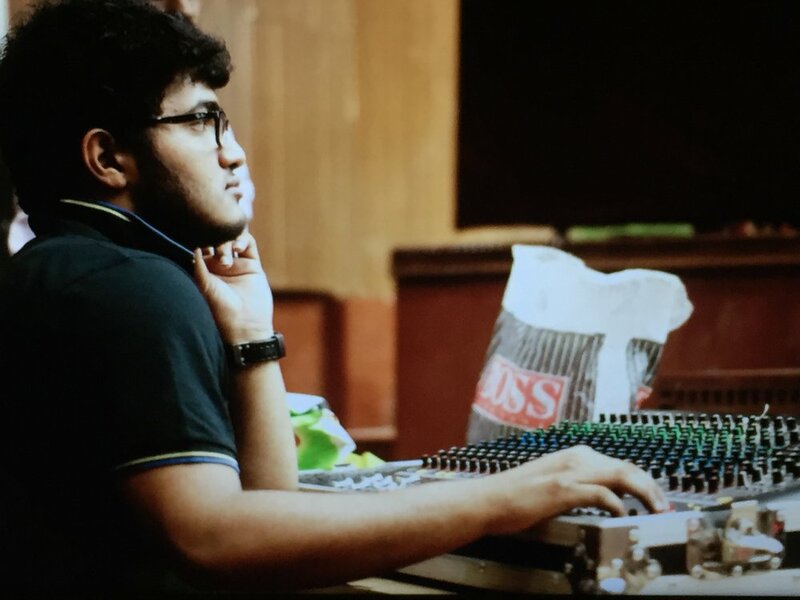 Short footage of my freelance sound engineering engagements and internships including those at The Royal Opera House, Thaikuddum Bridge concert, Maher Zain tour, Viva Madrid orchestra.etc. I underwent multiple internships in the these domains through which I developed interest in IoT (Internet of Things) as it involved my favorite domains including Networking, Embedded Systems and Internet Technologies concepts. Being a Cisco Certified Network Associate (CCNA), I got several opportunities to lend my skills as a Network Engineer and gain relevant industrial experience. Last summer I got to be part of one of the most renowned network research groups at TU Berlin with the Telecommunications Networks group. I carried out research on improving the standard compliance of the 6TiSCH protocol stack [TSCH parts of IEEE 802.15.4e Standard] by adding support for automatic network configuration. Designed an Indoor Positioning System using BLE technology (HM-10 Modules with CC2541 BLE Chipset as beacons). A Flask based backend server was set up to receive JSON objects from user's smartphone running an android app which sent RSSI (Signal strength) values for the trilateration algorithm. Front end GUI displayed location based on the XY co-ordinates received from flask server after processing. The BLE nodes network implementation and architecture was designed in such a way that the project can be scaled for IoT applications. Provided support for the the development of necessary hardware and software infrastructure for precise and out-of-band assessment of the end-to-end delay and jitter in the TWIST testbed. One of the major goals is to discipline the linux-based beagle bone black (PTP Server) using an external GPS-disciplined precise time source. My research work involves further extension of the 6TiSCH protocol stack(TSCH parts of the IEEE 802.15.4e standard) in TinyOS developed as part of the EIT Digital activity RICH on Reliable IP-based wireless protocol stacks for demanding Cyber-Physical Systems. The work is aimed at improving the standard compliance of the stack by adding support for automatic network configuration based on parsing info from Information Elements in the packet headers. I am also working on experimental verification of interoperability with the implementations in Contiki and OpenWSN by carrying out appropriate benchtop tests as well as larger experiments performed in TKN (TU Berlin)'s TWIST testbed. Developed a digital watermarking based matrix type symbol to enable point-to-point communication between hand-held devices. Multicolored Matrix (MCM) Code is a two dimensional matrix type symbol, consisting of colored squares, that is arranged as an image sequence rendered at an optimum frame rate to transfer simple data between devices using sender’s screen display and receiver’s camera. MCM code introduces an untried channel-less short range communication technology, designed with limitless storage capacity, great structural stability and flexibility due to which it can work in harsh lighting environments and still combat readability issues in the decoding process. 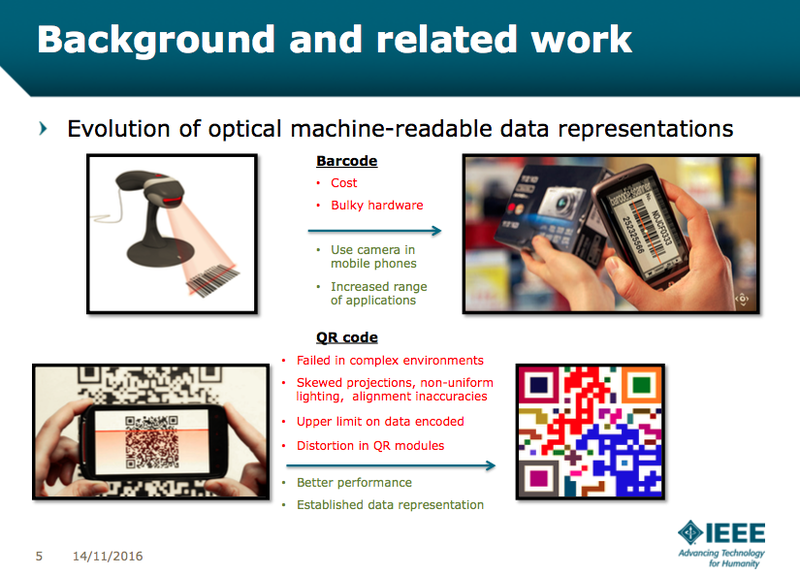 The idea, inspired by the existing QR code, has various code types in terms of number of colors and size of matrix depending on length of the data, in the code generation and encoding process. This paper introduces our new idea of data transfer, the technical features of the code along with the encoding-decoding techniques, bit error rates and future scope of improvements for the idea. Integrated static NAT/PAT to provide access to services located on a server in the private network to the public network. Implemented standard and extended access-lists to filter network traffic. Configured a site-to-site IPSec VPN using AES encryption algorithm, SHA-1 hash algorithm and RSA authentication method. Verified operation of IPsec at the network layer, protection and authentication of IP packets between participating IPsec devices and transmission of sensitive information over unprotected networks. Configured Cisco routers for Syslog, NTP, SSH operations and enabled AAA authentication with the help of TACACS servers. Verified firewall functionality from internal and external hosts after implementing Zone-Based Policy Firewall. Computer Communication Networks Minor Project: Conducted Energy Analysis of mesh networks and got insight about the duration of effective operation of the nodes. NS3 (open source network simulator) and Wireshark (packet sniffer) were used to carry out our experiments. Goals of the research involves improving upon existing RAAs and realize an effective cross layer approach involving the TCP stack in order to achieve enhanced performance over wireless channels, particularly in ”dense” scenarios. Here's a briefing about some of my projects in the lines of Embedded Systems. Most of my research and projects in this domain revolve around designing micro-controllers based wearable devices, developing various M2M communication protocols and Robotics. I have gained quality industrial and research experience through several workshops and internships. I am currently the Technical Head of the "Charge" SIG of ISTE (Indian Society for Technical Education), one of the premier tech clubs in the region. I organized prolific workshops and talks for students in the field of micro-controllers(RaspberryPi, Arduino, MSP 430, BeagleBoneBlack, etc. ), computer architecture, communication networks.etc. and head several embedded systems projects. Click the above links to view some of my embedded systems projects in Music Technology and Communication Networks. I represented my country to participate for the World Robotics Olympiad (WRO) for 3 consecutive years at WRO - Doha, WRO - AbuDhabi and WRO - Malaysia and secured Rank 1 (Gold) and World Rank 25 (Best Round Rank 14) respectively. I have also conducted several robotics workshops and competitions in my college and schools nearby. I mentor several Robotics groups in the region. 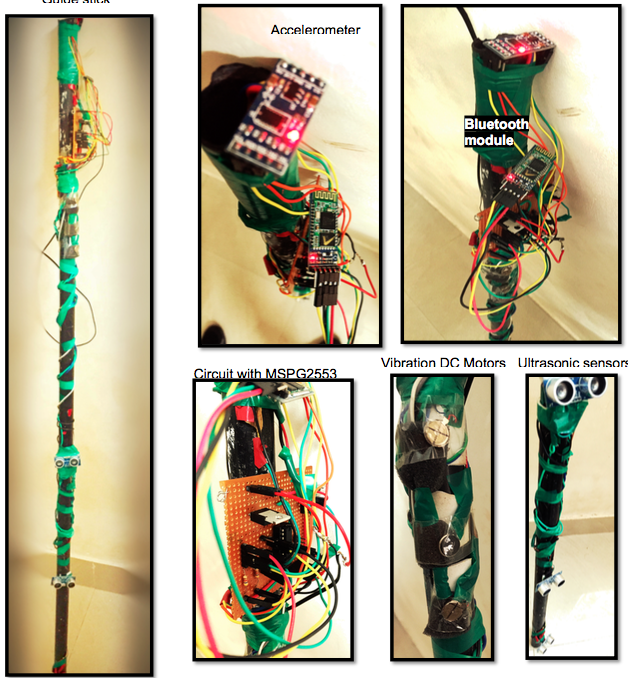 Designed a guide stick that can detect obstacles using HCSR04 Ultrasonic sensors placed at head, torso and foot levels interfaced with MSP430G2553 Micro-controller, which gives feedback through DC vibration motors attached to the stick. An accelerometer was mounted on top of the stick to detect any drastic shake/vibration to detect the stick falling. This would trigger an emergency interrupt to the user's smartphone via an HC 05 Bluetooth Module. The app on the smartphone receives these control signals to generate an emergency alert through SMS by sending the GPS co-ordinates of the user to the pre-chosen contact. Designed and soldered a POV based 8 x 32 LED Matrix screen that can display text and simple bitmap images. The circuit involves a TLC5916 array that drives the LEDs and this is controlled my TI's MSP430 G2553 micro-controller. The design was further modified to sync to music and later built a 3D version of the same matrix. All previous functionalities were adopted to this design in which games like 3-D snake and simple EQ based music sync could be displayed. I connected all electrical appliances (light bulbs, fans, switches, etc) in my room to opto-coupler traic pairs and 8 Channel Relays, whose inputs were fed by a state-machine based script run on Raspberry Pi(RPi). The RPi hosts the server that has a speech recognition module which requires voice commands as input. A python script is run to do text mining on the recognised text from user's speech. The commands can control back-light fit on the table, bed and other furniture. The LED strips array is configured to sync to music played on the server. Designed and constructed a swarm of robots(mounted with webcams) programmed to track a moving ball. Wireless communication between the bots was established using RF modules(CC2500) which worked on SPI protocol.